Old Norse mythology tells us that the Valkyrie were female characters who chose which warriors would die in battle and reach the afterlife of Valhalla. 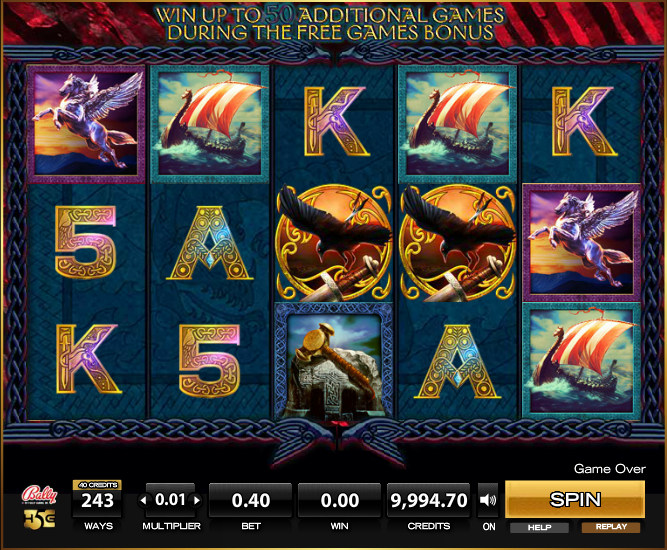 This online slot from Bally Technologies/High5Games uses the Valkyrie as it’s theme and includes some high quality graphics as well as couple of bonus features. The following review contains all the information you need before trying it out. Valkyrie Queen is a five reel slot with three rows and two hundred and forty three ways to win; standard payline structures are dispensed with and you will make winning combos as long as you land matching symbols in adjacent reels. The four high value symbols are the Valkyrie Queen herself, a Viking ship, the Valkyrie winged horse and Thor’s hammer – Mjolnir. The lower values are an ornate ‘5’, K and A. The Valyrie Queen logo is wild and substitutes for all others except the scatter which is represented by the raven/sword icon and only appears on reels two, three and four. This bonus is triggered by landing three of the raven scatter symbols anywhere on the centre three reels. You are now awarded ten free spins on a reel set which has the same prize values but looks a bit different; specifically the scatter symbol now has a silver background and landing three on the centre reels will award five more spins up to a maximum of sixty. Also known as cascading reels, this is a feature we always like and it’s present in both the base game and the free spins. After each win the symbols involved in that combo will disappear to be replaced by more falling in from the top; any new winning combos will also disappear and this sequence will continue until no more wins are formed. 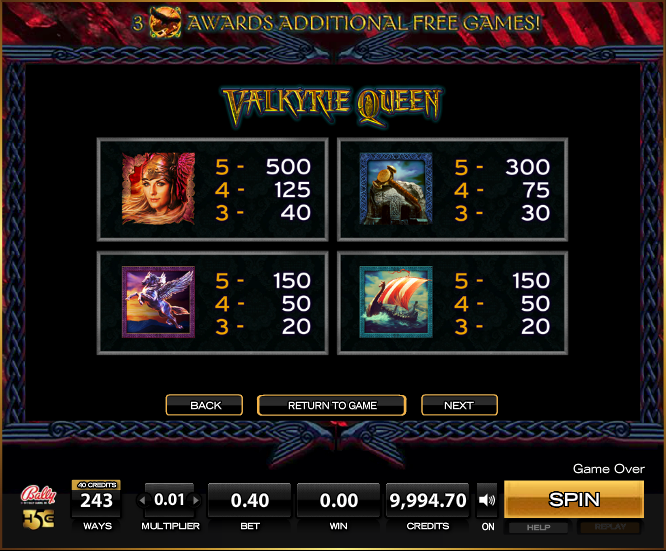 Valkyrie Queen is an enjoyable slot with some nice graphics and those ever-popular tumbling reels; it’s certainly worth some of your gaming time and it has a reasonable RTP of 94.90%.